In the mood for some more Hell and Damnation? 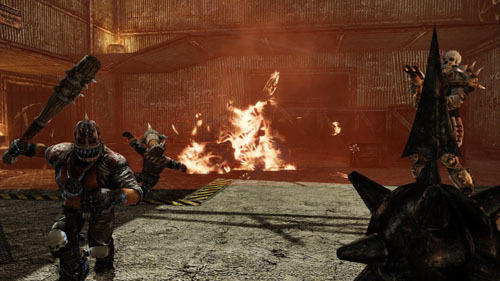 Good news then - the fourth DLC for Painkiller Hell & Damnation is now available. Entitled Full Metal Rocket, the DLC will net purchasers a goodly amount of content, as requested by the players. This includes HD remakes of three classic maps (called Mines, Meatless, and Blink) which can be played in a variety of modes (Survival, Team Deathmatch, Capture the Flag, and a new Survival mode), new skins, a new weapon, and one all-new HD map. Also available is the Painkiller Hell & Damnation DLC Bundle 1, which includes all four DLCs for the game. Full Metal Rocket by itself costs $3.99 and the bundle costs $14.99. They are currently available through Steam. While Painkiller Hell & Damnation has been out on the PC for almost half a year now, the game isn't out yet for the 360 and PS3. It will be out on May 31st on those platforms. We reviewed the PC version when it released and gave it a 3 out of 5.